Our good buddy, Denny Hartmann, with a nice Pomme de Terre muskie caught on the same trip I was on in September 2018. When asked if I wanted to go muskie fishing, one thought came to mind. 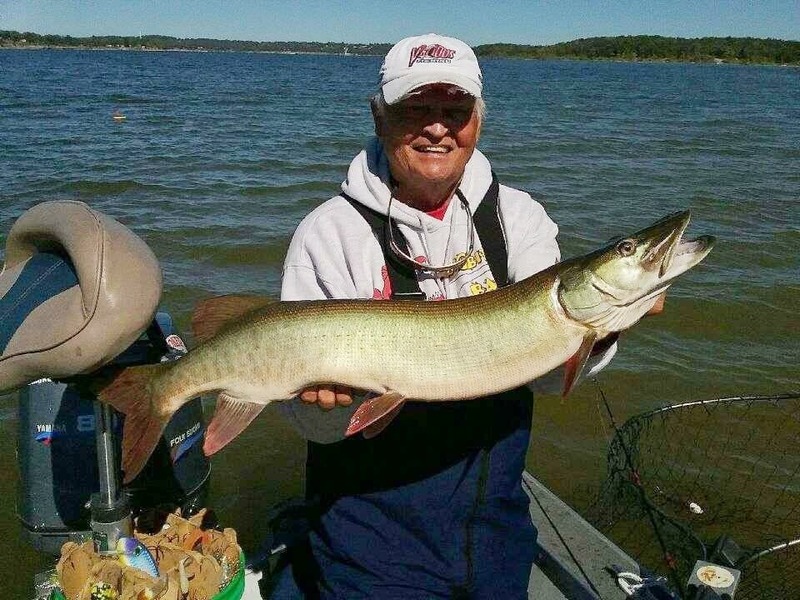 Muskies, Inc. organizes a “Guide for a Day” trip each fall on Pomme de Terre with the goal of educating anglers about the sport of muskie fishing. The event is significantly discounted for those interested in participating, and the funds raised go to the local Muskies, Inc. chapter. Their event also coincided with the annual Missouri Outdoor Communicators Conference on the same weekend, which is where I came into the picture. Muskies, Inc. also included many of the MOC members in their festivities. After checking into the MOC Conference at the brand new Best Western in Bolivar, we headed to the marina at Pomme De Terre. Each MOC member had his own guide. My guide, Tim Dunaway, quickly ushered me onto his boat. After seeing the large array of equipment, I soon realized he was a very serious muskie angler. His boat was set up exclusively for muskies. Well organized, heavyweight baitcasters lay neatly in a storage compartment. The oversized Muskie net was stored near the bow, clearly ready at a moment’s notice. My eyes were drawn to an upright tote at the base of the bow and stern seat. Inside it were the massive muskie lures. Giant spinners and crankbaits neatly lined the container. “It will take a big fish to eat a lure that size”, I thought to myself. My excitement rose with the speed of Tim’s boat as we left the Marina. When we reached our spot, Tim killed the motor. He handed me a massive baitcaster and hooked a black bucktail spinner on the end. “Cast and reel in” were his instructions. As I did so, he told me to dip my rod tip into the water at the end of each retrieve and do a wide “figure eight” with the lure. Muskies are naturally curious. They often follow a lure right up to the boat without striking. The figure eight at the end of the retrieve will often provoke a strike. Tim explained muskies are an apex predator in whichever lake they live. As such, they have nothing to fear from other fish and can feed on whatever they like but prefer soft bodied prey. Many times, they will hide under a dock or a submerged tree, waiting to ambush. As Tim and I both casted our lures, I noticed he would cast very close to the same spot I would. He quickly explained that muskies feed in windows. 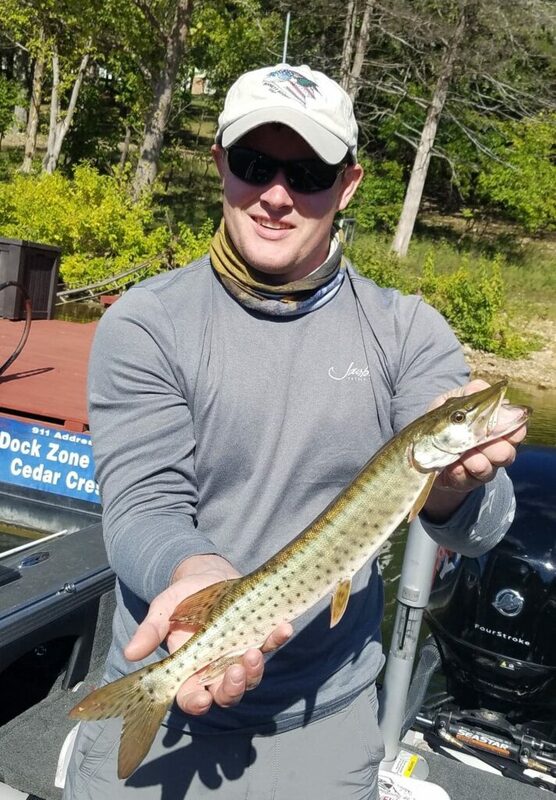 Multiple boats can cast to the same spot where a muskie is holding and it won’t strike or follow any of their lures if it doesn’t feel “in the mood”. Many times, you have to cast to the same spot multiple times to peak their interest enough to attack or follow. The first day of fishing produced an abundance of experience but no fish. By noon on the next, I began to realize why they called it the fish of ten thousand casts. George Donner, President of the Muskie Alliance and my guide on the second day, steered us into a small cove with docks lining either side. We casted as close to the docks as we could. I winced at the sharp metallic sound when the occasional cast would smack the dock. George would just smile and say that was the cost of getting where the fish were. George threw an expert cast as we passed a small, uncovered dock. It landed perfectly between the dock and the pontoon boat in its slip. As George retrieved his cast, I pitched to the same spot. After retrieving, I decided to give it one more shot. As soon as my bait hit the water, a giant splash of angry teeth erupted from below the pontoon. It pile-drove my hand-sized bait into the float of the dock. I set the hook almost out of sheer surprise! The muskie thrashed and shook its head. From start to finish, the fight lasted about thirty seconds. Though he was small, the Muskie had the most vicious attack I had ever seen from a fish. The monotony of cast after cast was taxing on my mind and body. However, after seeing the ferocious attack that small muskie inflicted on my lure, I repeatedly found myself thinking one thing. Fishing, Mahoney Outdoors, Muskie Fishing, Muskies Inc, Payden Hays, Pomme de Terre. Bookmark.